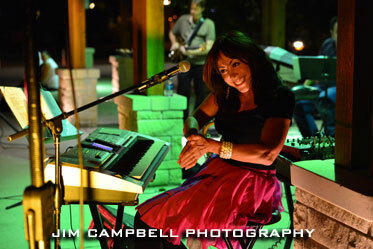 "Anita, thanks again for performing at the party for my wife’s 60th! You and your musicians were fantastic! Almost every person there asked me who you were, how I found you, etc. so you clearly made a great impression! Most importantly, Caryn had a spectacular time and was so appreciative of you learning her 2 favorite songs! You performance of Suite: Judy Blue Eyes was just great! We are looking forward to watching you perform at the various places you play in the future! You were such a pleasure to work with, thanks again!" "The Anita Rosamond Band is outstanding. They played at our daughter's wedding at Westborough Country Club. We got so many compliments from our guests. My new son-in-law said he could listen the the brass section all night long. It's like you have an orchestra at your reception.Very impressive. This band plays a wide range of music and makes an excellent presentation. I totally recomment Anita and her band." Bruce E., Father of the bride. "I am extremely honored that you were available to be such an important part of my daughter's wedding. It means more to me than you can know. You were absolutely incredible and you more than exceeded all of our expectations. And, that all-star band . . . with each member giving well over 110%. The talent in the room was unbelievable. Most importantly, you gave us your love and treated us as if we were very special." "Thank you so much making my daughter's wedding so special! It was a fantastic night and I heard many complements of the band, which I wanted to pass along to you! I was so excited, when Scott told me that you are available for Kelly's Wedding date - that was big blessing by itself................. You truly are the best! We have been sending out your contact info to many people that attended the wedding! Hope to see you around again soon!" "Anita absolutely lights up the room! Her talents set her apart from all other entertainers!"